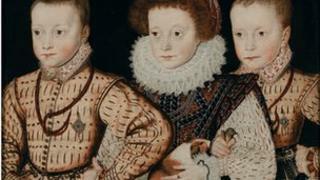 A rare painting of three Elizabethan children and their pet could be the earliest portrait of a guinea pig, the National Portrait Gallery has said. The privately-owned portrait - which has not been seen in public before - is part of the gallery's upcoming exhibition, Elizabeth I And Her People. It was painted by an unknown Anglo-Netherlands artist around 1580. Popular in Europe as exotic pets, guinea pigs were introduced from South America by Spanish traders. The youngest boy in the painting is holding a small bird, likely to have been a finch. The portrait - simply titled Three Unknown Elizabethan Children - is part of the exhibition at the London gallery which opens on 10 October and runs until 5 January 2014. The exhibition aims to reflect the rise of new social classes in Elizabethan society and will feature other portraits and objects from the era. A miniature 16th Century portrait of Elizabeth I that turned up in a house clearance sale will also be on display. The gallery bought the previously unknown miniature at an auction late last year for £329,000. The queen is featured dressed in ermine alongside a peacock in the painting by Isaac Oliver titled Elizabeth I and the Three Goddesses. Other paintings that will be part of the exhibition include an elephant on a crest, a falcon and an intricate purse made in the shape of a frog. The exhibition will also include more than 100 objects, such as costumes, jewellery and coins. Other portraits on show will include those of explorers such as Francis Drake and poets such as John Donne.